Photo right: This image captured a labor of love carried out by men from the Seashore District and the Nicaraguan Methodist Church in Masetepe, Nicaragua. The Seashore District has been in covenant with the Nicaraguan Methodist Church for 10 years. In December of 2016, persons from the district met over a weekend with lay and clergy leaders to discuss how we can be in partnership in a common vision to fulfill our Methodist vision to "spread scriptural holiness" across the world. After days spent getting to know one another, we prayed and committed to the following: 1. Be in prayer for each other's concerns and thanksgivings. 2. Open and honest conversation. 3. Respect the priorities set by the Nicaragua Methodist General Conference in matters of construction and program. 4. The mission is to be a partnership with our district and the Nicaraguan church working together. 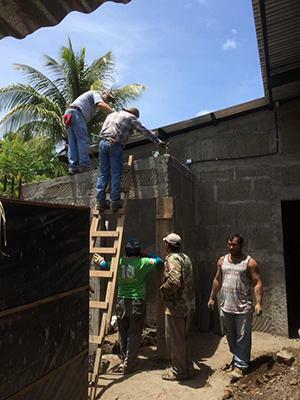 For the past three years, Wayne Jones, lay member of the Seashore District's Poplarhead UMC, has worked with the Nicaraguan Methodist Church in constructing sanctuaries. Jones and a local construction coordinator work in partnership with the local congregation in designing, raising funds, purchasing materials and coordinating teams from the Seashore District, the Mississippi Conference and others who join Nicaraguan Methodists for a six to eight week project. Lodging, meals, translators and materials are coordinated through Jones as he works with the church's volunteer in mission coordinator. I am pleased to report Masetepe Methodist Church is nearing completion. Several Seashore District congregations (small, medium and large membership) have joined together in raising funds and teams. A congregation of several dozen children and adults who have met for over five years underneath a tree will now be able to meet through the rainy season hosting worship, discipleship, community service events and a place of prayer. Once their sanctuary is complete, Masetepe intends to join in the construction of another Methodist Church in the Leon area. To schedule a team for 2017 contact me, Seashore District's Mission Coordinator, Rev. David Newton at newtondavid93@icloud.com or 228-475-7888.